Looking for ideas to create a garden that reflects your personality? This 13-month calendar contains inspiration featuring different gardening styles. A great gift for yourself, family or friends. Additionally, there are seasonal tips on how to care for your garden sustainability, as well as timely planting suggestions. Not into growing your own fruits or vegetables? The "In Season at the Market" section is just for you. NOTE: This calendar is suitable for climate zones from California’s Central Valley to the foothills. For other climate zones, modify the tips as needed to adapt to your area’s growing conditions. 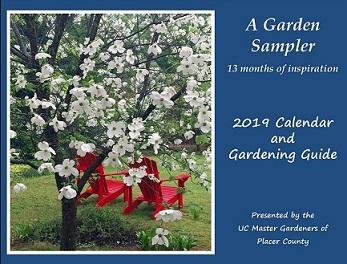 Proceeds from calendar sales are used by the Master Gardeners of Placer County to bring to you events like our Garden Faire, Speakers by Request, Hotline and other support activities. Use your credit card. Your calendar will be delivered to your door for a small shipping and credit card fee. Purchase from a vendor in Placer, Nevada and El Dorado Counties. [Click Here] for a complete list of events.